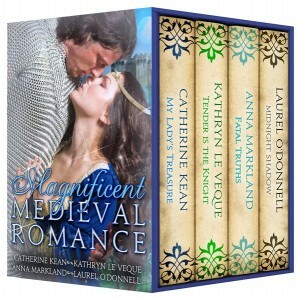 The Medieval Mavens are back with an amazing new collection of medieval romance novels in the Magnificent Medieval Romance Collection! Get it on Amazon now. HE is a powerful Norman nobleman haunted by memories of a troubled past who has sworn never to marry. SHE is a Scottish noblewoman masquerading as nursemaid to her own children. Only lies can keep them alive. SHE is a lady desperate to save a kidnapped child. HE is a tortured knight seeking redemption. Forming an uneasy alliance, they search for legendary riches and find a treasure worth more than gold. HE is a powerful knight who assumes the mantel of command when his father dies in battle. SHE is the enemy’s daughter, offspring of the man who killed his father. Can their love overcome old hatreds and betrayal from within? This entry was posted in Medieval Romance Monday and tagged anna markland, catherine kean, kathryn le veque, laurel o'donnell, medieval mavens, medieval romance monday. Bookmark the permalink.